I have two weeks to get my $500 Postal Jeep, Project POStal, ready for a huge trip across the country, and I’m so far behind it’s not even funny. One minor problem that has been a major headache has to do with my ignition system, and it needs to get fixed. Like, right now. High-pressure wrenching is the worst. It just leads to anxiety and dumb mistakes, and—as was the case with me this past weekend—it can sometimes lead to an inability to just slow down for a second, and properly understand the problem at hand. Rochelle hitting my sludgy-encrusted valve cover with some foaming cleaner and a wire brush on a drill. Before I get into that, there’s a tiny bit of good news to report. Thanks to my friend Rochelle and Jalopnik reader Urambo Tauro—saints that they are—I’ve got my driveshaft in place with new u-joints, and I have my engine all back together with a nice, clean valve cover, a new water pump, and a decent thermostat housing (off a Jeep 4.0—since the old one was pitted). The engine’s intake and exhaust manifolds are in place. Previously, I’d been having trouble with my exhaust manifold’s heat riser—essentially a flap that, when it’s cold outside, diverts exhaust gases towards the intake manifold to warm up the intake charge. This flap was broken away from its shaft, which was supposed to be rotated by a bi-metal thermal spring (which was also broken). Except I didn’t, because the flap—I found out at the very moment documented above—is made of brass. My welder basically laid an egg, and I felt a bit like an imbecile (this is a common occurrence while wrenching). Anyway, I took the manifold to the machine shop, had them braze it for $15, and then I bolted the cast iron exhaust collector to the intake manifold, and fastened the set to the side of my cylinder head. The Carter YF is an incredibly simple single-barrel carb. I simply took it apart with a flathead screwdriver, dipped all the parts in a bucket of carb cleaner, sprayed out and cleaned all my jets (I’d like to have used compressed air, here, but some cans of carb cleaner did the job), installed a new needle and seat, set my float bowl height with the ruler that came in my carb rebuild kit, and tightened everything back up. If you don’t have any clue what any of that meant, don’t worry, I’ll do a carb rebuild explainer later, but for now, the point is: My carb is fine. Unfortunately, I still have no clue how well that carburetor is dialed in, because after placing the Jeep’s radiator onto the nose of the mail Jeep, filling up the cooling system with antifreeze, and attaching all the electrical connectors, turning the key only cranked the engine over. It did not induce combustion. I pulled a spark plug wire, and grounded a dummy plug to the engine—when there was no spark during cranking, it was obvious that my ignition system wasn’t working properly. The Jeep ran before I replaced its cylinder head, so there was no reason for it to fail now, I reasoned. As an initial check, I took the new ignition coil, distributor cap, distributor rotor, and ignition module off the Jeep, and installed the old parts. Then, after jumping a bunch of the wires with some new ones to try to bypass any sort of short, I gave in—I had no choice but to break out the schematics. Lucky for me, this 1976 Jeep DJ-5D has the simplest wiring diagram I’ve ever seen. The image on the left is the entirety of the ignition system, and with many of the wires bundled, the whole setup looks relatively clean and easily comprehendible when you look at it under-hood. That’s why it was so frustrating when I couldn’t figure out what was wrong. I bypassed all the wiring, installed old parts, and even went through the checklist in the service manual. I failed test number three, since—using my multimeter—I found 12 volts across both the posts of my ignition coil. This lack of voltage potential between the two posts was equivalent to a “bulb doesn’t light” condition, indicating—per this service manual—that my ignition module or its ground were bad. But with a new ignition module, and having bypassed the ground, I knew this wasn’t right. I checked the resistance in the coil and tested if the coil’s wire to the distributor would arc against the engine block if I grounded the negative coil terminal. It did, confirming that the coil was fine. The distributor is bad. So I went ahead and hooked the spare distributor—which is a Ford “Duraspark” design—to my current ignition module, which is a largely-derided “Prestolite” design, and gave the distributor a nice spin. The result: a nice, blue spark between my spark plug’s ground and center electrode! I’ve also read that my “Prestolite” ignition module won’t work with this “Duraspark” distributor, even though I’ve proven via testing that it does, in fact, function. The only question is: for how long? After all, I was hearing a little buzzing noise when I hooked that distributor up. So that’s where this project sits right now. 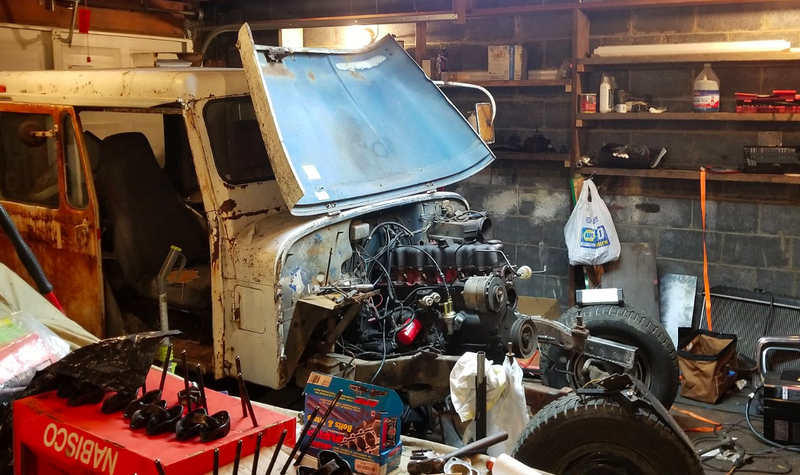 I need to get this engine running, and the Jeep driving so I can do lots of shake-down testing before I leave on April 10. So I’ve got to fix this distributor issue as soon as possible. Ideally, I’d just pop this 1980 distributor in, and do a little bit of wire-splicing so the connectors line up, but if that doesn’t work, I’ll have to look into going to a High Energy Ignition system, which has the coil built in, and would let me ditch my ignition module, which—based on what I’ve read online—has a tendency to fail. In any case, I need to solve this very soon.